Once dismissed as an “odd-looking little artifact,” the tool pushes back evidence for tattooing in the U.S. Southwest by a millennium. THE TOOL IS made from a bundle of prickly pear cactus spines, their tips saturated with dark pigment, inserted into a handle carved from lemonade sumac and bound with yucca fiber. 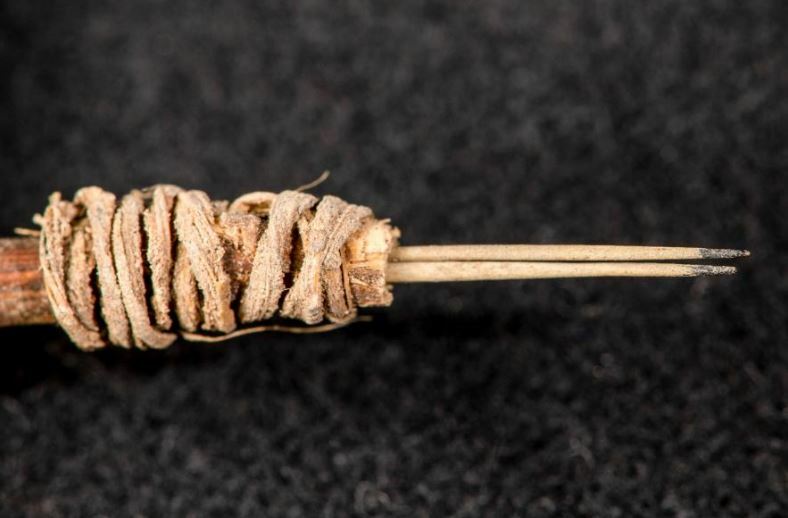 Some 2,000 years ago, a tattooist in what’s now southeast Utah used this tool to hand-poke a design into someone’s skin. After the point of one of the cactus spines broke off, the tool was likely tossed into a trash heap. It remained there for centuries, in a pile of bones, corncobs, and other discarded items. Now, in a new paper in Journal of Archaeological Science: Reports, a team of archaeologists conclude that this cactus spine tool is the earliest evidence of tattooing in the Southwest. The tattooing tool has had an interesting journey since its disposal two millennia ago. In 1972, a team of archaeologists excavated the trash heap in Turkey Pen site in the Greater Cedar Mesa area. Without giving much thought to the “odd-looking little artifact,” as one archaeologist later called it, the team packed hundreds of objects from the site into boxes for storage at Washington State University.